I meant to post this jammie picture yesterday, but, as you can imagine, the day was busy with opening presents, putting said presents together, and cooking. I will have reviews up for these pjs later today and tomorrow. I hope you all had a great holiday. I’ll be back later with the dets. This entry was posted in Crafting for others, Gifts, Kwik Sew, New Look, Pajamas, Sewing, Simplicity. Bookmark the permalink. These are super cute – Congratulations! I can’t wait to hear tell of the tale of how these came together! You did a great job! And how adorable do they all look standing in front of the tree! Glad you had a wonderful holiday! What a gorgeous photo. Are all three your kids? Wow, you’re a busy woman. The PJs and nightdress are lovely. A photo to treasure. Awwww! they are so adorable. what a cute bunch. 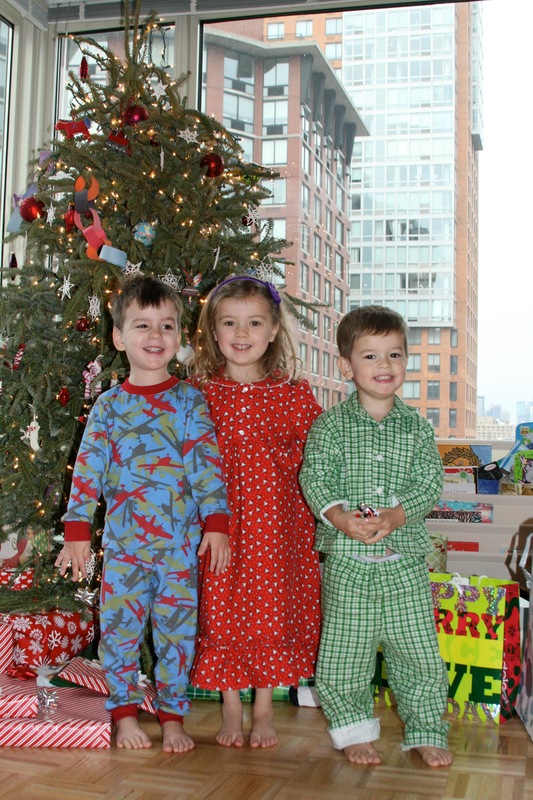 Cute kids and cute pjs. I bet you’re tired of sewing pjs! The jammies and the kids are ador-able!! Merry Christmas! You did it! And wow, they look adorable in their snazzy new duds. Merry Christmas Elizabeth! Happy New Year! Very cute!! Are the boy/girl twins? Curious cause I have boy/girl twins with a big sister almost exactly 2 years older than them 🙂 Great job on making the jammies!! What a wonderful picture! You must be so proud!